Before the Web, there was Gopher. This month saw geeks casting their eyes back to the early 1990’s in response to a long article about the pre-web protocol Gopher. Tim Gihring, a former AP reporter, tracked down developers from the University of Minnesota team that brought the world its first widespread experience with hyperlinks and bookmarks. The article credits Mark McCahill — a windsurfer — with coining the phrase “surf the internet.” Gopher developer Alberti even points out that Tim Berners-Lee used Gopher to share information about his idea for the worldwide web. And in 1992 Tim Berners-Lee actually approached McCahill about collaborating on Gopher/web hybrid. But it was still a world of mainframe computers — UNIVAC was headquartered in Minnesota — and McCahill remembered the university’s computer center’s opposition to personal computers as “a religious war” in which he found himself siding with the heretics. From then on, his goal would be “take technology that is cutting edge and get it to the point that it’s palatable to mom and dad and English majors.” In 1989 he developed one of the first e-mail clients with a GUI interface — POPmail — and began working on a project to connect all of the university’s online computers. The university hated Gopher, however — and according to the article, literally forbid the team from doing any further development on it. There was no central authority overseeing which information became available on the network — and it committed the even greater sin of not using a mainframe computer. Finally, the computer center’s director agreed the Gopher could use their own time to continue working on it. But with little interest from the university, they decided just to release the software to the larger internet community. They were riding high. Senator Al Gore came to visit the campus. 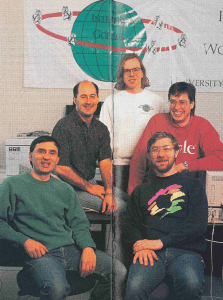 Between 1992 and 1995 they held four GopherCons — attended by everyone from the New York Times to representatives from Microsoft. The poor six-person Gopher team was still answering calls to the university’s helpline, and never did receive any additional funding — while supporting a software being used by the rest of the world. The university even considered axing the department altogether and outsourcing all of the university’s computer maintenance. “In the spring of 1994, Web traffic overtook Gopher traffic for the first time,” writes Tim Gihring. “Gopher, within a few months, began to decline. Its reign had lasted three years.” Ironically, the final nail may have been the university’s unwillingness to fund the team. When bad accounting by a top transplant surgeon at the University led to indictments for fraud and embezzlement — later dropped — the whole Gopher team was diverted to building an accounting program…using the web. And his article also offers another lingering look at a third competing technology called Hyper-G, which the Gopher pioneers seem to think was the best option. “You have to be at the right time and place to have your technology take off and become popular,” said Gopher developer Farhad Anklesaria. “If you’re too early, you won’t last. But the article led to the second round of discussion, first becoming a reminder of how much things had changed, startling memories and triggering fond remembrances all around the internet of today. It drew 721 upvotes — and 173 comments — when the article’s URL turned up in Reddit’s “programming” subforum, and 141 more in a forum about Minnesota. Fortune.com even ran an article about Gihring’s article. 232 people upvoted the link when it appeared on Hacker News — drawing 62 comments, many about how the internet has changed. “Honestly, I wish it were still non-commercial: available to be used by companies (as it was even in the 90s), but not as an advertising medium.” One sad comment read “I miss Gopher. I remember when the Gopher sites started to display: “This service has been discontinued. Please use WWW instead.” But someone else pointed out that six months ago the popular discussion site Metafilter brought back their Gopher server “after 15 years of downtime” when one of their users requested it. Feature image: Jackson State University’s Gopher tutorial.